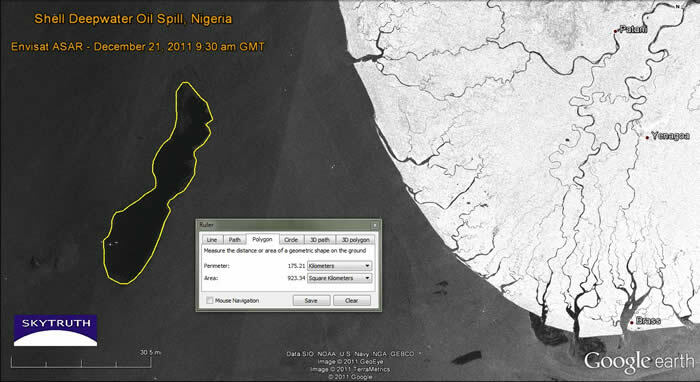 It’s not a question of if it will happen, but when it will happen – yet another spill, this time of over 40,000 barrels, has just happened off the coast of Nigeria. Satellite monitoring service Skytruth reports that their imagery “reveals a slick covering 923 square kilometers (356 square miles).” Read about the new spill here. This entry was posted in News and tagged coastal ecosystems, marine disasters, nigeria, northern gateway, spill by haidagwaiicoast. Bookmark the permalink.